Have you ever wondered how many individuals are spending more than 3 minutes on your website? Or if your website leads come from organic search, paid ads or social media? If so, Goals are the answer to these questions! 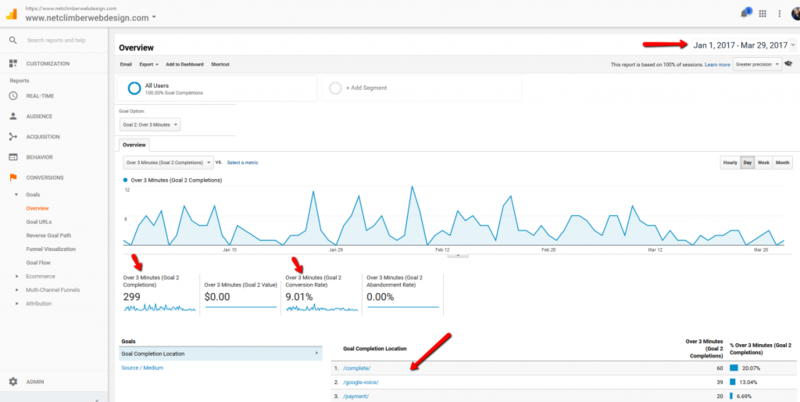 The creation of goals within your Google Analytics interface can establish the answers to these questions. 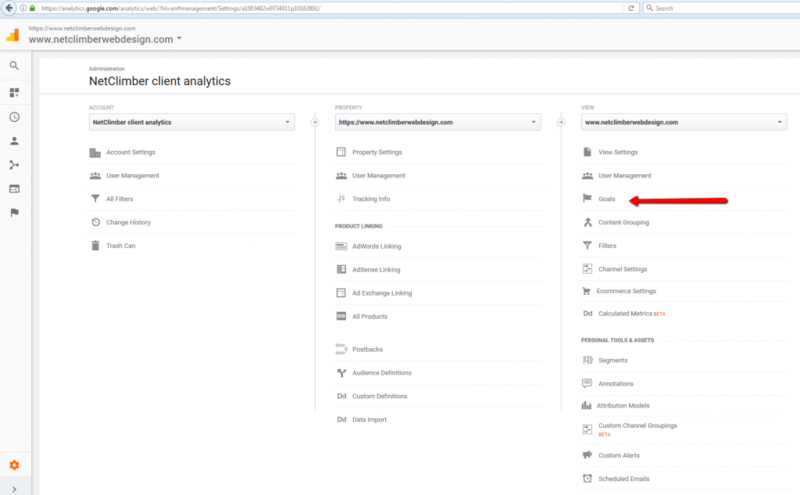 These goals can be viewed as an additional dimension of your standard Google Analytics reports. 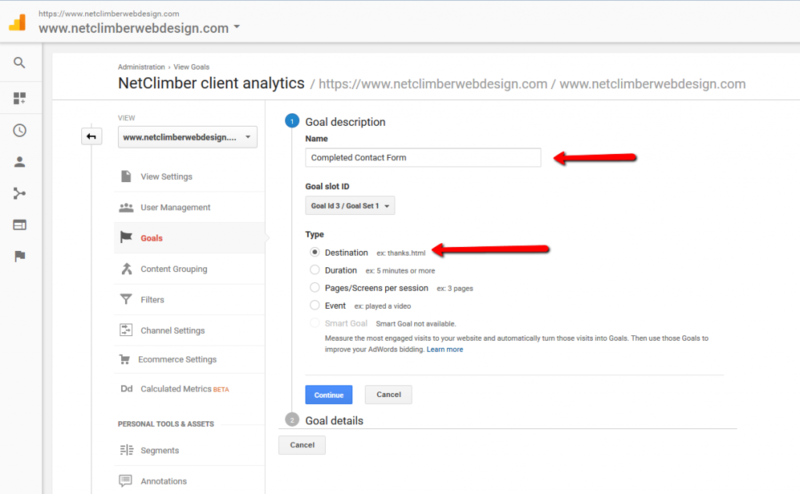 Through this post, we will demonstrate how to establish two types of goals and how to view the data within your Google Analytics reports. From the menu on the left side of the page select Admin. Within the Admin menu select the appropriate Property and View, then click the Goals menu item. Destination – you can establish a goal when someone views a certain page of your website. This is often used for the successful completion of a contact or request form when the form takes site visitors to a specific Thank You For Your Submission page. The destination URL with be unique to each website. Duration – A duration goal can also be created. 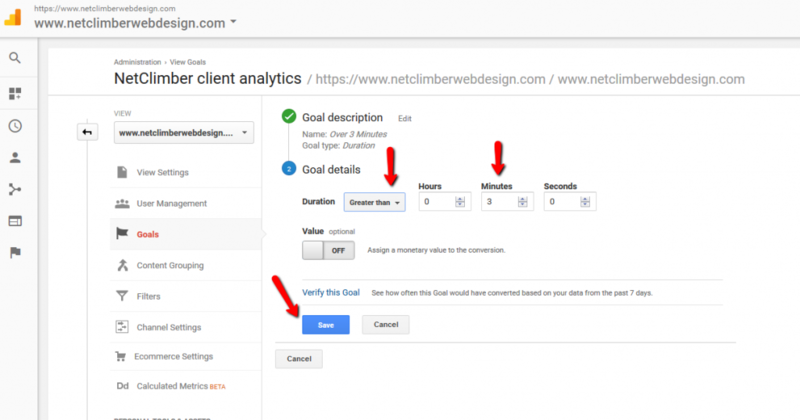 This type of goal can be used to track how long individuals are viewing your website. 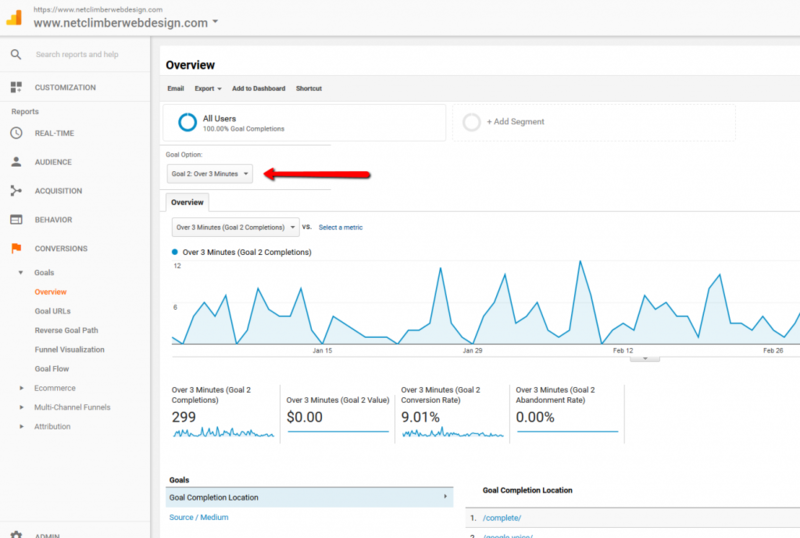 It is an impressive engagement metric if your website is able to hold a visitors attention for several minutes. 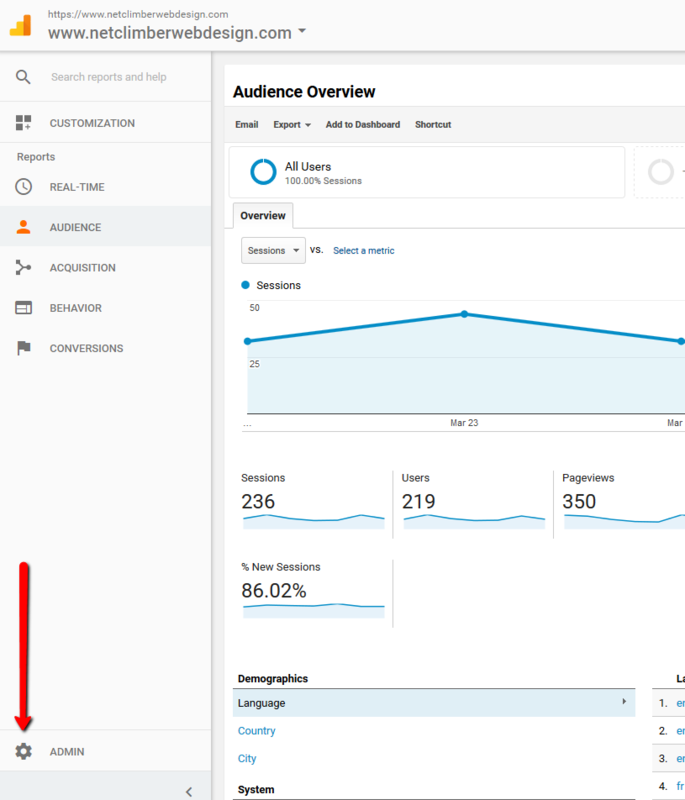 Pages per Session – Another engagement measurement is tracking how many pages a user views during each website session. 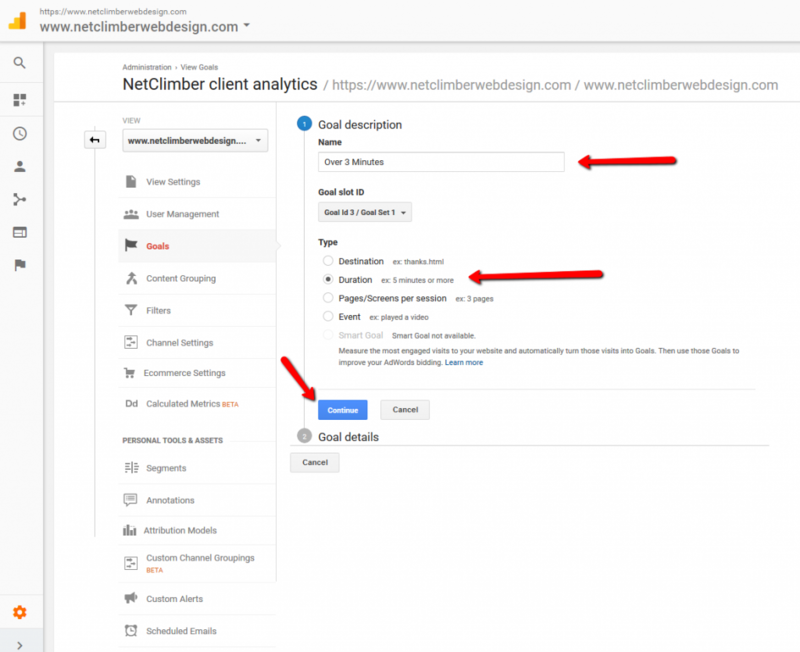 Event – If you are using event code on your website to track specific on-page actions of your site visitors, these events can also be set up as conversion goals. After you select the +NEW GOAL button, you will see the following page. This is where you give your goal a Name and the select the appropriate Type. See the information entered below. After you press Continue, you are prompted to select the specific duration. In this case, we have entered 3 minutes and Saved our new goal. We are going to demonstrate one more commonly used goal – a Destination goal. The destination goal will enable us to track how many completed contact/request forms we have received. The first steps in creating a destination goal are very similar to the creation of a duration goal. Enter a name for your goal, select the type of Destination and press Continue. Within the Goal details, you are able to enter the appropriate URL for your destination goal. 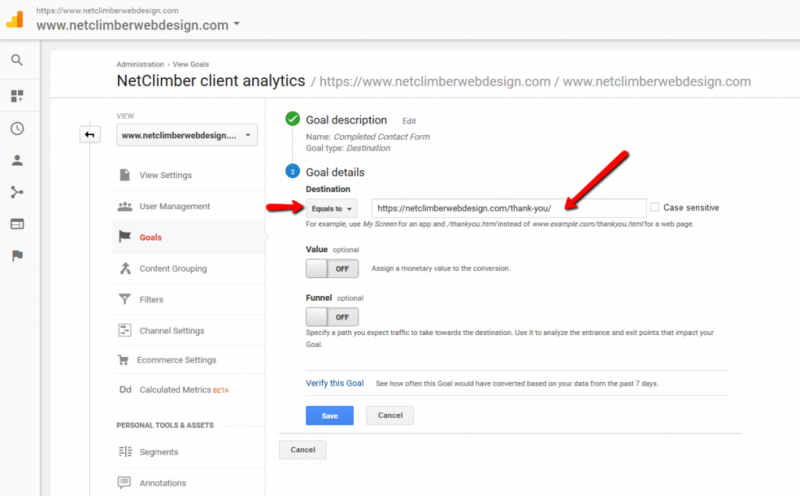 In this case, we would like Google Analytics to track this exact URL so we have chosen Equals to and then enter the specific URL (https://netclimberwebdesign.com/thank-you/) within the text box and Saved our new goal. Once your goals have been collecting information for a number of weeks, you can review the data through the Goals Conversions report. By default the Goals overview report will contain an a summary of all of your goals. Generally, this data is not particularly useful. We would suggest that you specifically choose the desired Goal Option you would like to review. In this example, we are reviewing the Over 3 Minute goal. We can see that from January 1, 2017 to March 29, 2017 we had 299 completions of the Over 3 Minute goal. This corresponds to a 9.01% conversion rate. In this day and age, having anyone stay on a website for more than a few seconds is a win. To have 9% of your visitors stay on your site for over 3 minutes is very good website engagement. 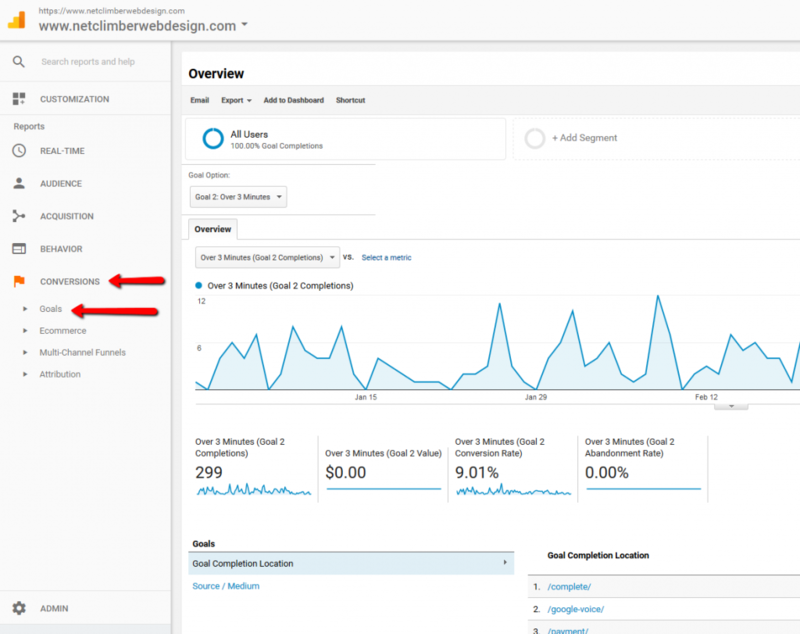 With this new information you can see the Direct traffic to your website is most engaged with over 16% of the visitors reviewing your website for over 3 minutes. For most business websites it is very useful to establish at least one duration goal. Decide on the number of minutes that you feel is exceptional for your website content then establish a goal. It only takes a few minutes. You can read the reports the same way for your form completion goals. You are able to tell which channel is driving the most engaged and the most interested parties to your website. This can help give you the information you need when it comes time to invest. Do you put your money into social, into SEO, into PPC advertising. 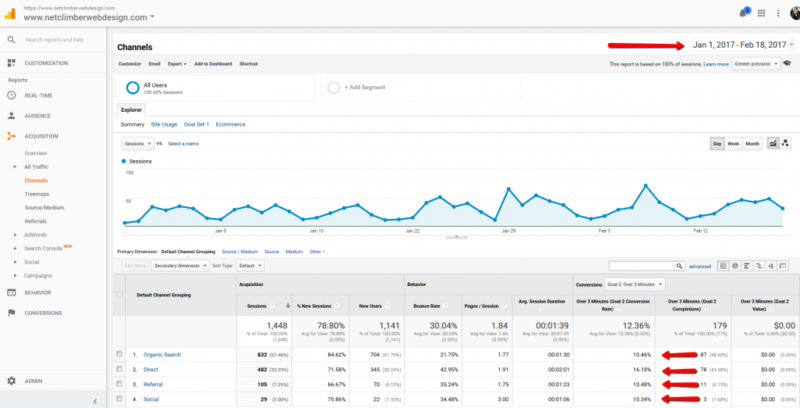 These reports can help give a clearer picture as to who is most engaged with your website.